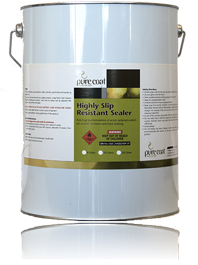 pure coat Highly Slip Resistant Sealer is an opaque solvent based sealer. This sealer has been specifically developed to have a grip like quality reducing the likelihood of slips even when the surface is wet. pure coat Highly Slip Resistant Sealer has a semi-wet look finish ideal as a water repellent barrier around the swimming pool and slippery areas exposed to wet weather. Penetrates below the surface giving protection in depth, and increases the life of the treated surface. particularly stained, dirty or moss covered surfaces. Avoid use near naked flames or other sources of ignition. Ensure good ventilation during application of the product.